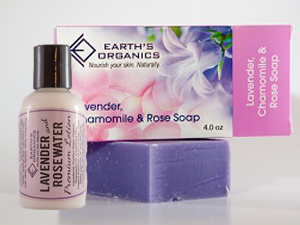 This lavender, chamomile, and rose soap from Earth's Organics is incredibly moisturizing and will leave your skin soft and smooth. The refreshing aroma and rose combination promotes an uplifting mood. It lathers well, calms you, and its the perfect way to start or end the day. The lavender and rosewater lotion perfectly compliments the soap. This lotion scent is extremely intoxicating. Once you apply it, it gives you positive and uplifting energy and it makes you truly feel like a woman. It's very floral and sweet and rich in vitamins and minerals. The rose water comes from Bulgaria in its purest form, and the essential oils are certified organic. Just a small amount, and your skin will feel moisturized, healthy, and luminous. Due to my 16-month-old son's chronic eczema, our family switched over the majority of our household and toiletry products to all natural versions soon after he was born. I was excited to try out Earth's Organic's soap and premium lotion, and I ended up being very pleased with both products! I really appreciated the natural ingredients used and felt comfortable putting it on my baby's skin. The soap is a bar soap which was great for my own needs, but I personally prefer a liquid or foaming soap for the baby (easier for me to deal with a bottle when it comes to curious, grabby little hands!). I found the soap to be moisturizing and it lathered well for a natural soap! Even more than the soap, I REALLY loved the lotion! It was moisturizing, absorbed quickly, and the smell was wonderful without being overpowering or too floral. It has very quickly become a purse staple and I plan to buy an additional bottle to keep in the diaper bag! I really liked this product, I'm pretty sensitive to scents so I was a bit nervous when I opened it and could smell the lavender strongly. But much to my surprised it never irritated me. I've been using it all week and my skin feels very soft. I like how well it lathers and how subtle the scent is in the shower. I even used it to shave and didn't experience any irritation at all. I love the lotion it has such a beautiful smell to it and very moisturizing. I've been using it before bed, after I wash my face, and my skin feels so hydrated, It didn't cause any breakouts as well. After testing it on myself I was brave enough to try it on my baby who has very sensitive skin and eczema. I'm happy to share that she didn't have any negative reactions as well. All in all, I love the product and would love to buy more of it. I love how this product smells! It smells fresh and clean. Also, since the ingredients listed are all comprehensible words (versus reading some chemistry equation as in other soaps), I felt safe and confident using this as a pregnant mom, that the scent and ingredients were not artificial. Plus, lavender is known for its soothing and relaxing properties and I felt the effects. This was the type of soap that I looked forward to using in the shower. The soap and lotion were also popular with my 3 kids. They loved the scent and the purple color of the bar soap too!